This new work is a set of unfired clay bowls to be displayed outdoors. A bowl is the most common of household objects in Asia. This widespread use of a such a simple object draws a connection to all basic life forms. 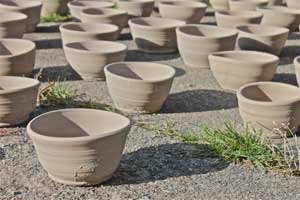 Being unfired, these bowls are fragile and they will eventually return to their original form: lumps of mud and clay that can then be used to make bowls all over again, just as the end of a day and beginning of a night is a prelude to the coming of yet another day. The lifecycles of these unfired bowls highlight the cyclical nature of things in this world. Displaying the artwork outdoors exposes it to the elements of nature, which serve to vividly demonstrate the impermanence of all things.